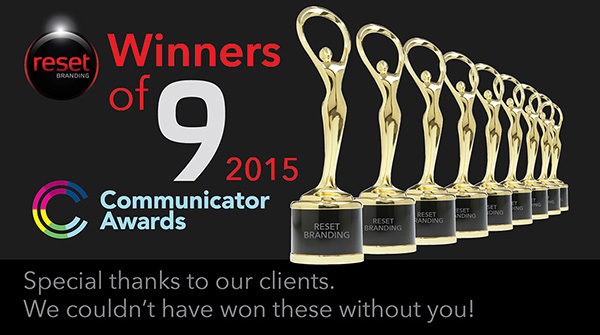 New York, NY (June 30, 2015) — Reset Branding has walked off with a trophy-case full of Communicator Awards, as announced by the Academy of Interactive and Visual Arts today. The Communicator Awards, based in New York, honors the best in advertising, corporate communications, public relations and branding. This year’s competition received thousands of entries from agencies of all sizes, making it one of the largest awards show of its kind in the world. The nine awards join multiple 2015 PAC Global Leadership Awards, snagged by the design firm last month, as announced by The Packaging Association of Canada. 2015 has been an unprecedented year of achievements and accolades for Reset Branding and is led by internationally recognized designer Franca DiNardo. We'd love to hear more about your brand challenge. © 2019 Copyright Reset Branding Inc. All Rights Reserved.